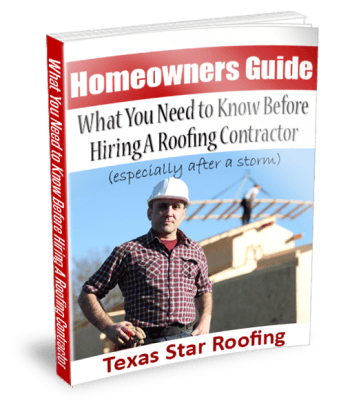 Texas Star Roofing offers you this homeowners guide to choosing a roofing contractor. It’s about a 15-minute read and should be used as a tool for planning your home roofing project. Please take the time today to go through it. Even better would be for you to print it out so you can make notes and get clear on what you need to know before hiring a roofing contractor. As one of North Texas’ oldest and most respected roofing firms, nothing is worse than finding out that one of our neighbors hired a roofer who failed to deliver on their promises, especially if the roof was purchased after one of the storms our area is notorious for. If you choose the wrong firm, you can end up with poor quality materials, shoddy workmanship or worse. But it doesn’t have to happen. We’ve been serving our community since 1997 and have served thousands of your neighbors during that time. We’ve earned an A+ rating with the Dallas Better Business Bureau and awarded the Angie’s List Super Service Award every year since 2008. If you need to have your roof repaired or replaced and have any questions at all, contact me here and we’ll inspect your roof free of charge and with no obligation. Or just pick up the phone and call me at (469) 626-6921 and I’ll be glad to help you out.